Enjoy UHD 4K resolution with compatible content in nearly any environment with the BenQ LK990 6000-Lumen XPR 4K UHD Laser DLP Projector. Its 6000 lumens of brightness overcomes ambient light in many situations, while its 3,000,000:1 dynamic contrast ratio helps keep images and text clear and distinct. Its 1.38 to 2.02:1 throw ratio and 1.47x zoom provide a range of installation options. The LK990 has HDBaseT, VGA, and three HDMI inputs to support both analog and digital video sources. Its HDMI output allows you to daisy-chain multiple projectors or displays to show the same video source, and the 1/8" audio output to connect external speakers. It is controllable via Ethernet, HDBaseT, or RS-232 and includes a remote control. The virtually zero-deviation alignment of the BlueCore laser diodes helps boost luminous flux into the light tunnel to produce up to 6000 lumens of brightness. Dual synchronized BlueCore color wheels use an additive yellow segment, simulating the RGBY spectrum for augmented chromatic performance that achieves up to 92% of Rec.709 color coverage. The DLP chip is hermetically sealed to resist heat to help it provide up to 100,000 hours of life without degradation. 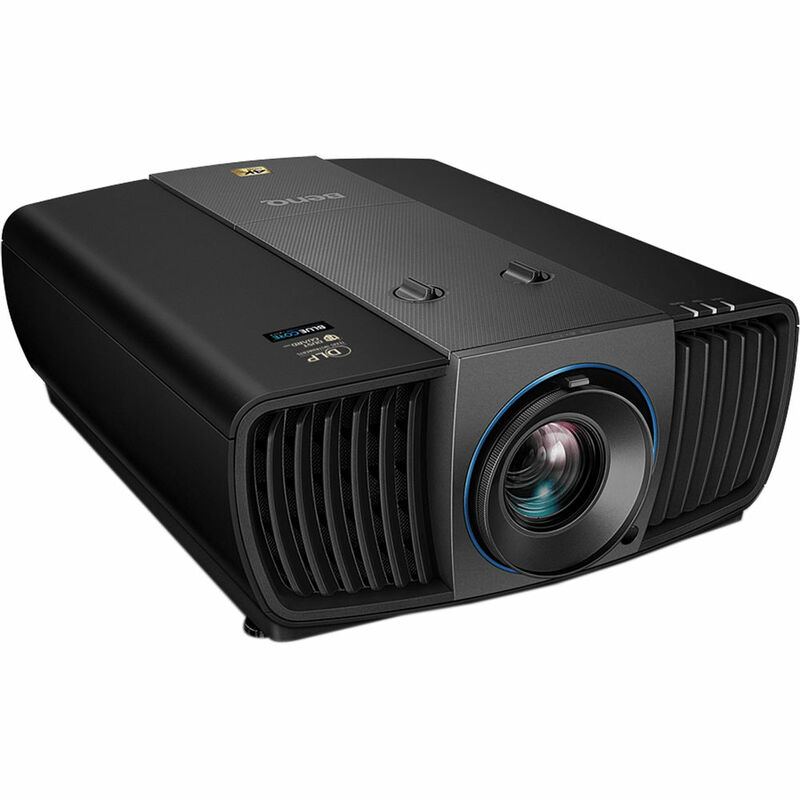 The BlueCore line of projectors use a single-chip DLP designed to produce true-to-life colors and legible text with virtually no blurring, shadowing, or interference patterns. The DLP chip can last up to 100,000 hours without degradation. With HDR10 support and BenQ's Auto HDR Color Rendition, the LK990 is engineered to provide enhanced brightness, contrast, and image optimization in a single step. This technology is designed to provide lifelike color performance that's automatically tuned to reflect nature. 4K Image Amplifying Technology is engineered to automatically upgrade the resolution of all projected images to 4K for enhanced detail. Additionally, the LK990 also has Pixel Enhancer 4K, a motion-adaptive edge-enhancement feature designed to detect changes in the color between an object and its background to help produce sharp edges and precise surface textures. The LK990 outputs up to 6000 lumens of brightness for enhanced image quality in bright environments like sports bars, private guesthouses, or weather-protected outdoor installations. Thanks to its laser light source, the LK990 provides up to a 3,000,000:1 dynamic contrast ratio for deep blacks, vivid colors, and fine detail. It also features spontaneous response, requiring virtually no wait time to turn it on or resume from screen blanking. The LK990 offers a DICOM Simulation Mode that allows the projector to simulate the results of devices compliant with the Digital Imaging and Communications in Medicine (DICOM) Part 14 standardized display function, for display of grayscale images. The DICOM Simulation Mode, which supports both Blue and Clear Base, adjusts the gradation between the minimum and the maximum luminance, so gradation is distributed optimally. This feature is optimized for displaying medical images such as X-rays, CAT scans, and MRIs, which makes the LK990 useful for non-diagnostic purposes such as lectures, academic meetings, and hospital conferences. This feature is recommended for use in medical schools for training and educational use only. The laser light source can last up to 20,000 hours, resisting color decay over time, making the LK990 well suited for presentation or exhibition applications. The LK990 is designed with sealed laser modules and enclosed light engines to help protect the DMD chip, color wheel sensor, laser light source, and other optical components. The lock-and-key design hermetically seals the engine from dust (IEC Standard 60529IP6X) to help prolong projector lifespan. The LK990 uses two cooling systems designed to help ensure optimal thermal conduction during operation. The circulatory liquid cooling system helps protect the laser light source and DLP engine, even after constant operation in ambient temperatures up to 104°F, while the heat pipe cooling system cools the DMD chip for enhanced reliability. Additionally, the LK990 has a series of embedded thermal sensors to control the projector's temperature and ensure optimal operation. These sensors can detect the temperature of the laser system and surrounding environment in real time and automatically adjust the speed of the fans. Equipped with an integrated air pressure sensor, the LK990's High Altitude Mode automatically alerts you to enable efficient cooling and properly maintain operating temperatures in high-altitude environments with thinner atmospheres. The LK990 can be tilted vertically at any angle, allowing projection onto ceilings, walls, floors, or angled signage to fulfill nearly any projection demand. The horizontal and vertical lens shift options, as well as 1.47x zoom, help you align images in nearly any challenging venue, such as when lights or vents are located in the mounting area. Lens shift enables you to move the image up or down by 60% of the screen height or left or right by 25% of the screen width, while the zoom offers a wider range of throw distances for installation flexibility in various scenarios. This feature lets installers shrink the image to 75% of its original size in 0.5% increments via the OSD menu, allowing installers to more easily fit an image within the desired frame. The LK990 is compatible with a number of projector control systems, including Crestron, AMX, and PJ-Link for network control via LAN, making it simple to integrate into corporate network infrastructures. When there is no LAN infrastructure, the LK990 also supports RS-232 for reliable long-distance installations up to 49'. BenQ Multiple Display Administrator (MDA) software provides centralized multiple-projector management, including automated opening and closing procedures for public spaces, remotely controlled power on and off, and scheduling for institutions and corporations. HDBaseT connectivity combines video, audio, and device control signals from multiple sources including computers, laptops, document cameras, and Blu-ray players onto a single CAT5 cable, helping to ensure seamless transmissions up to 328'. With the laser light source lasting up to 20,000 hours of maintenance-free operation, the costs associated with lamp replacement and maintenance are virtually eliminated. Based on the average brightness cutoff of typical lamps, the laser light source can exceed 10 lamp replacements over the lifetime of the laser.